Springfield Armory has just announced the New York City Police Department (NYPD) has approved the Springfield Armory XD-S 9mm pistol as a back-up or off-duty firearm for their officers. This is a huge development for Springfield Armory, with a serious potential of sales in a highly restrictive market. NYPD requires their officers to purchase their own duty firearms from an approved list, which is surprising considering the onerous restrictions on handguns in New York City. The NYPD currently authorizes the Glock 19, Smith & Wesson 5946, and the Sig Sauer P226 DAO as primary duty firearms. The Springfield XD-S with the flush 7-round magazine. The New York City Police Department (NYPD) wanted to provide off-duty officers with a pistol option providing excellent concealment and proven reliability. The single-stack XD-S® 9mm pistol provides officers both concealment and controllability, with decent ergonomic features as well. Springfield Armory engineers worked closely with the NYPD Firearms Training Section and Firearms and Tactics Unit to develop a specialized XD-S to meet NYPD requirements. 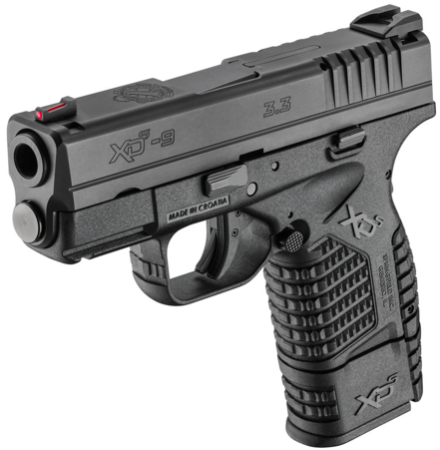 Officially labeled the XDS9339BNYPD, the NYPD XD-S model is primarily the same as the original XD-S with slight modifications to the grip safety spring and connector to ensure the NYPD XD-S met stringent NYPD policy guidelines for trigger pull weight. Though not specifically mentioned in the press release, I would imagine this adjustment would increase trigger pull weight to the standard NYPD 12-pound trigger pull. 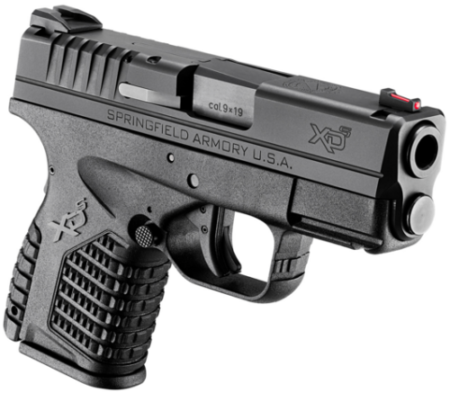 The Springfield XD-S 9mm with extended 8-round magazine. With the new approval, NYPDofficers may also carry the XD-S® 9mm NYPD Model as a backup gun while on duty as well. After passing the department’s rigorous testing procedures, the Springfield Armory XD-S gained acceptance for use with no performance modifications and only the minor adjustments mentioned to meet NYPD policy guidelines. The Springfield Armory Law Enforcement team completed the XD-S® Armorer’s Training Program April 9th, marking the official launch of the program to all uniformed officers. 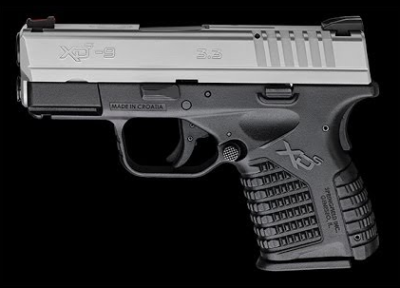 The Springfield XD-S 9mm also offers a 2-tone option with a stainless steel slide. The NYPD special edition XD-S pistol comes with (3) 9mm magazines, including a 7-round flush model and (2) 8-round extended magazines. Like the commercial XD-S® the NYPD model includes a 3.3-inch hammer forged carbon steel barrel treated with Melonite™, with an overall width of only 0.90 inches. With the flush magazine installed, the weight of the pistol is 23 ounces. The addition of the Springfield Armory XDs 9mm pistol to the approved firearm list is very interesting, considering the enormity of the NYPD, and the department’s influence on many of the other law enforcement agencies in the area of New York City. Not surprisingly, New York City has the highest concentration of law enforcement agencies and personnel in the entire United States. The New York City Police Department is the largest law enforcement agency in the United States, with nearly 36,500 officers, and over 50,000 total employees. However, New York City has nearly a dozen other police or law enforcement agencies servicing highly specialized areas in America’s most populous city. New York City Police Department School Safety Division. These additional New York City police agencies add over 16,000 more law enforcement officers that would likely be eligible to purchase a Springfield Armory XDs after the NYPD decision. In addition, the State of New York hosts over a dozen State Police agencies within the city of New York as well. Having shot the Springfield XD-S at SHOT Show I was very impressed with pistol’s small size, reasonable recoil management, and overall feel. I know there have been a few problems with both the .45 caliber and 9mm XD-S pistols failing to feed properly, but I’m confident the NYPDFirearms Training Unit gave the small pistol a thorough work over before authorizing the XD-S for back-up and off-duty use. When the XD-S first came out I was really impressed with the pistol (both .45 and 9mm). In fact, I felt the .45 ACP version shot better than the 9mm, which was a bit snappier in recoil. I’m not as big a fan of the larger XD pistols, just from my personal preferences, but I know several people who have been very pleased with theirs. I’m glad to see NYPD offering their officers more options for off-duty and back-up options. However, I do have two concerns. First, the XD-S is completely different from the NYPD duty pistols so there is no interchangeability of magazines and the triggers will be completely different for the S&W and Sig Sauer duty pistols. This could play a critical role in an officer’s survival during a deadly force encounter where they have to transition to their back-up pistol. Second, the 12-pound trigger pull weight is ridiculous. Many NYPD officers have never handled a firearm until the Academy (thanks to highly restrictive local laws), and an extra heavy trigger is solely designed to reduce payouts for unintended injury or damage. New York City would rather pay a few thousand dollars to an officer’s surviving family, than potentially millions to an unintended victim. This places NYPD officers at great risk at the most critical moment of life and death situations.